Get set… we’re taking part in Sustrans Big Pedal 2019, the UK’s largest inter-school cycling, walking and scooting challenge. The challenge runs from 25 March to 5 April. It’s free and we would love everyone to be involved. Oak Cottage PSFA invite you to this year's Fashion Show. See the latest from leading High Street Brands and get the chance to buy at 50%-70% off! Ticket requests can be made via the school office. Please support our PSFA in raising funds for our school, we look forward to seeing you on the night. We are delighted to inform you that we were successful in the 'Tesco Bags for Help' scheme and we have been awarded the fantastic sum of £4000. 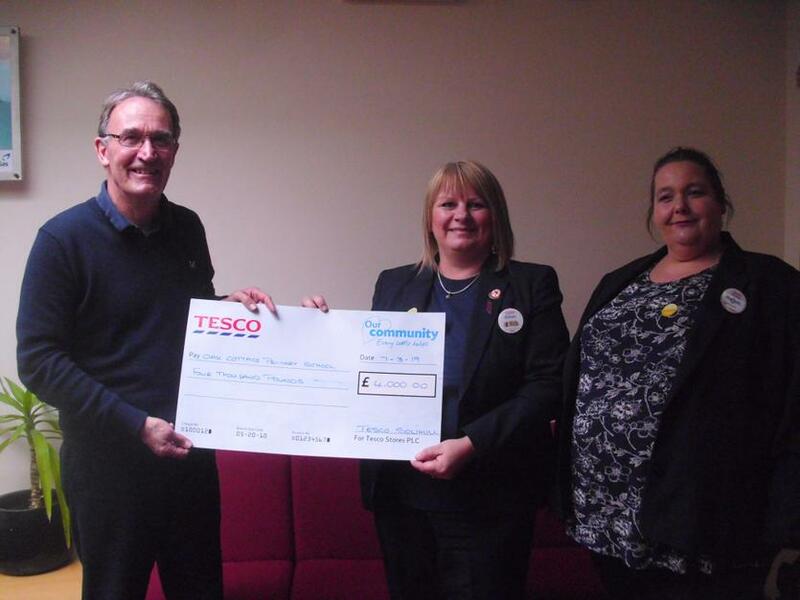 Staff from Tesco came into school to present our cheque to Mr Goddard, Chair of Governors. The scheme saw us in local Tesco stores and customers had to deposit tokens to support the project of their choice. Thank you to all of you who supported us. It was British science week and completed lots of fun activities throughout the week! Here is a useful link for some fun ideas to try at home. World Book Day this year was Thursday 7th March with the theme of 'Share a story'. The day was marked with various activities around school and we know from previous years that children love to dress up as a character from one of their favourite books. Staff also entered into the spirit of the day! World Book Day tokens will be given out on the day for discounts against certain books. ‘Make a swap when you next shop’ Change 4 Life Campaign in Solihull launches locally on Monday 4th February for 4 weeks. Children are eating twice as much sugar as they should be which is bad for their health (that’s an extra 2,800 sugar cubes a year). Too much sugar can lead to serious health problems like type 2 diabetes, heart disease and painful tooth decay. This campaign will help parents take action by introducing them to a simple new tip, “Make a swap when you next shop”, encouraging them to make simple swaps to lower-sugar food and drink options. • Look out for the ‘good choice’ badge in-store. This year, the UK Safer Internet Centre is particularly focusing on how consent works in an online context and exploring how young people ask, give, and receive consent online. This could be in their friendships or relationships, how they take and share images and videos or how they manage their privacy and data. Our school participated alongside hundreds of other schools across the UK and students learnt about how to use the internet safely and positively. All classes will be learning about E-safety during this day and there will be an assembly too. The PSFA Christmas Fayre was very well attended and everyone enjoyed themselves. There were many different stalls and the Travelling Book club. Thank you to all who attended and supported our school. We even had a visit from Santa! With 2018 marking 100 years since the signing of the Armistice and the end of the First World War. Oak Cottage marked this date with a beautiful display of poppies in our school all hand made by the children over their half term break. Poppies were made from paper, card, fabric and even knitted! Thank you to all who returned their poppies. Big thank you to all our parents and children who kindly donated to the Helping Hands Charity as part of our Harvest Festival. As you can see below it was a huge success! We are holding our open morning on Wednesday 10th October 9.30-10.45. No appointments are necessary, we look forward to seeing you soon. Our summer fair has become an important date in our school calendar – not only as a social event for the local community, but also a fundraising opportunity. The weather was beautiful and it was very well attended thank you!. During half term week and again in June, Secure Trust Bank, in conjunction with SMBC come into school to give our environmental garden a makeover. We were very excited about this project and we hope you agree the results have been amazing. A big thank you to all those involved. Please see our before and after photographs below. We held the annual Oak Cottage Prom in the Playground on Friday 15th June at 2pm. The programme included the Rock Bands, solo instrumentalists and groups of instrumentalists who are learning in school. Everyone enjoyed having the opportunity to be outside and the children had a fabulous time. The Bikeability Cycle Training Course run by Solihull MBC took place for Year 5 the first week back after the Whitson Spring Holiday. Children who successfully achieved their Cycling Proficiency may, with their parent's permission, cycle to and from school and bikes may be left in the cycle area. The School Council were very busy planning this year's Charity Week. This year we chose to support Marie Curie and Juvenile Diabetes Research Foundation. Please look for more information about these charities on their websites, https://www.mariecurie.org.uk and https//jdrf.org.uk/. Thank you for the support you gave us with the various activities we carried out, everyone took part and had lots of fun.